Rabbi Yitzhak’s class: 3:15 p.m. The will be no Shabbat Shiur for Women through the end of January. The Nava Yitzhak’s Children’s Supervision is run by Nava Yitzhak in the Serene Center Zayan Hall every Shabbat from 10:30 – 11:30 AM. We wish a Refuah Shleimah to Prof. Isaac Daniel (Yitzhak ben Bella), Albert Hazan (Avraham ben Rivka), Yitzchak Moshe ben Perel, Mordechai ben Tamar, Ariella Leba bat Chana, Ivy Baruch (Ivy bat Rachel), Martha Bitran, Cecile Esses, Nagia David bat Yaffa, Rahel bat Freha Hasson, Marcelle bat Mazal, Melida Ordoñez, Belinda Soussana, Rachel Leah bat Yehudit. The Rabbi is creating a new list of names of people who need a Refuah Sheleima, which he will read on Shabbat. If you have any names please email them directly to Rabbi Yitzhak at hhyitzhak@aol.com. EVERY JEW HAS A LETTER IN THE TORAH… DID YOU FIND YOURS?? Join the Evanston Community Kollel Ateret Mordechai’s SEFER TORAH CAMPAIGN and purchase your letter, word, or pasuk for only $10 a letter. You will also receive a stunning certificate indicating which letter(s) belongs to YOU! Mazal tov to Shirel and Yoel Lipkowitz on their recent marriage. May they build a Bayit Ne’eman BeYisrael, leShem uleTiferet! Shirel’s parents, Mr. and Mrs. Mario and Eloisa Solano, and by friends of Shirel and Yoel. This Shabbat is the Yahrzeit of Aliza bat Shaba, mother of David Mishlati. The Mishlati family prepared a few of the salads and kugel in her memory and her Zechut. 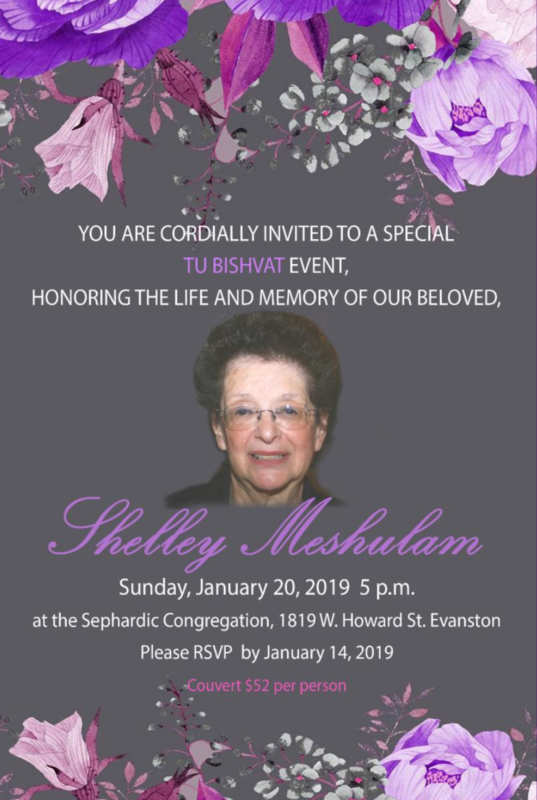 If you would like to sponsor a Shabbat Hamim or Seudat Shelisheet in honor of, or in memory of, a friend or loved one, please contact the office at (847) 475-7707. Please send in your Tu B’Shvat Dinner reservations if you haven’t already done so – thank you! The next Executive Board meeting will take place Sunday, February 3, at 10:00 a.m. The Kollel thanks the patrons for their generosity! Our Rabbis teach that there is enormous power and merit associated with supporting Torah learning. As such, please consider sponsoring a night, a week or a month of learning in the Kollel. You may sponsor in memory, or for a speedy recovery, or in honor of a loved one or friend. In addition to the great merit of supporting Torah in our community, your sponsorship will be marked with printed pages noting the intent of your support that are placed in stands on the tables in the sanctuary for the duration of your sponsorship period.